Grand National Winner for Petal Sculpt!! What great news that my Petal Sculpt dress pulled top prize at the style awards for Ladies Day at Aintree last week. Thats a better result than winning any each way bet on the horses! Here’s the article from, plus a picture of the winner, Sophie Fairclough with Colleen. Always knew it was a favourite! 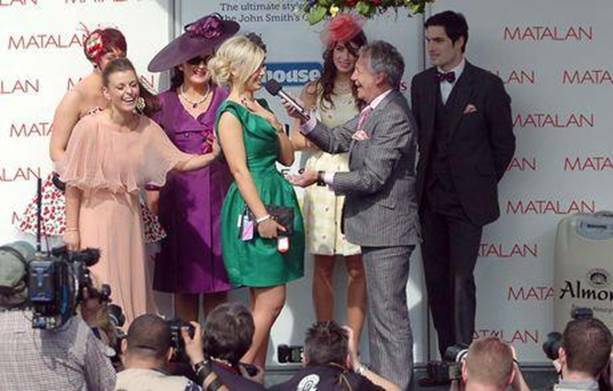 Fashion news….Suzannah ‘Petal Sculpt’ Dress wins Style Award at Aintree…. Journalism student Sophie Fairclough 20, from Formby, won the Style Award at Aintree at the weekend dressed in a striking silk emerald green dress by London based label Suzannah. She accessorized the dress with Christian Louboutin heels and a matching bag. (Judges included fashion legend Jeff Banks) Designer Suzannah Crabb said ‘Sophie looks amazing in my dress – she really deserved to win’. Sophie won a new car, worth £12,000, a 10-day holiday to Barbados for two and a photoshoot at a top London studio as well as £200 to spend in Cricket and a goody bag from Benefit. The five finalists had been picked out of 1,900 entrants on Ladies’ Day by judges, Sheree Murphy, Emma Johnson, Ricky Whittle, Colin McAllister, Justin Ryan, Justine Mills and Lorraine McCulloch and designer Jeff Banks. Previous Article Liz Jones can’t resist….